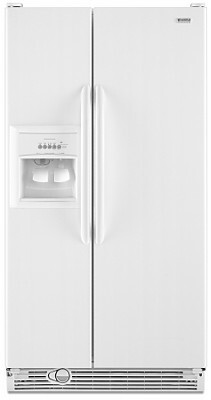 OVERVIEW: The Kenmore 5896 Side by Side Refrigerator is one our favorites in theKenmore line. The styling might be lacking a bit, but thefunctionality and capacity were quite impressive for the price. If you have a growing family, this might be the perfectchoice. STYLE: This was the one area that we found this particular fridge freezer was lacking. There's truly nothing overwhelming about the style choicesmade on this model, but if functionality were style, this model wouldget some serious points. CAPACITY: ThisKenmore Fridge Freezer has a 25.4cubic footinterior which was ample, but because it was well designed, we foundthe space seemed quite large.. The 10.0cu. ft. freezerwas larger than most in this category, and the space was well utilized. NOTABLEFEATURES: The Quiet CoolTechnology helped to keep this Kenmore fridge freezer running on thequiet side. Even in our cement filled test kitchen, itsoperating noises were at a minimum. Like in other Kenmore Refrigeratorsthe Pur Ultimate II Water and Ice dispenser generated some of the bestquality tasting water and ice in the side by side refrigerator category. EFFICIENCY:It’s ENERGY STAR qualified which means that not only will you save money on your utility bills, you will also be eligible for an Energy Star Rebate.